Last week, I have this drawing done in photoshop, it was for my hubby’s birthday. He loves it and suggested i should put it in my shop for sale. I like the idea so here I am making another version in watercolor. 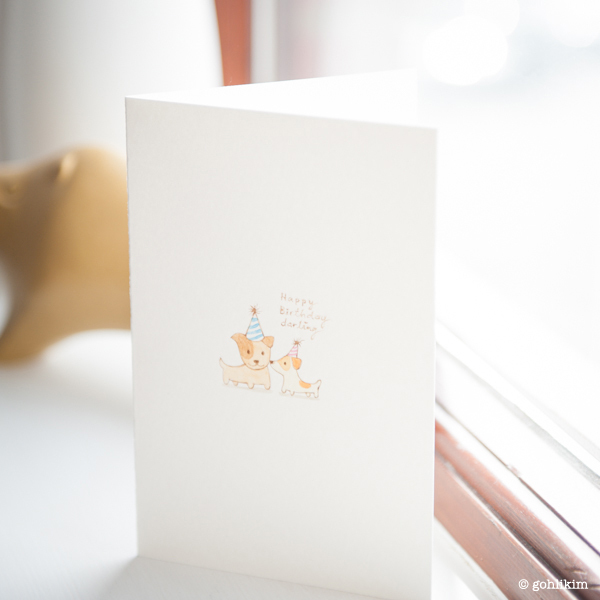 I would like to share the process of making this simple and cute birthday card. As watercolor paper is very fragile, i try to avoid drawing directly onto it, i do not want to damage the surface of the paper by erasures. 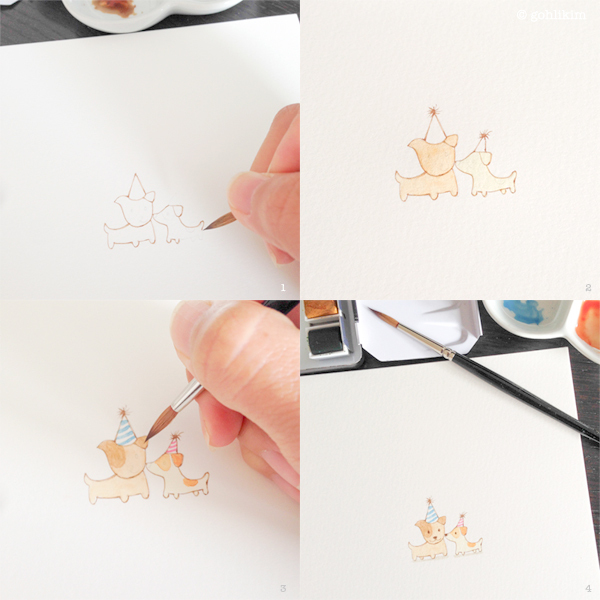 Below is how i transfer my drawing to watercolor paper. 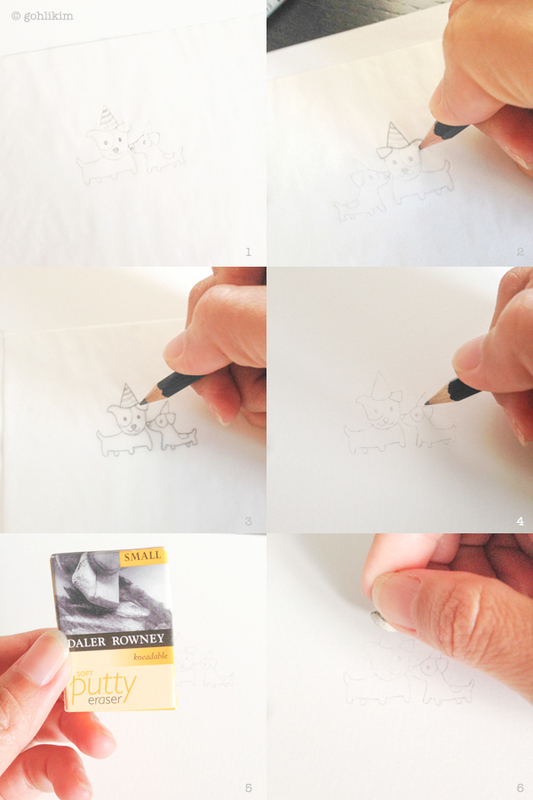 I trace over my drawing on a piece of tracing paper (image 1), turn it over and trace the back of the drawing with a softer pencil (B or 2B) (image 2). Then turn in over again, place and fix onto the watercolor paper in the position i want and trace it (image 3). I retrace the transferred image with a H or HB pencil for a more clean line (image 4), and lift all the dust, smudges and any loose graphite with a kneadable eraser (image 6). I love it when I’m done with the tracing part. I think tracing is boring but at the same time, very peaceful. :) Now is time to paint. Start with the outlines, then the lightest section. Make sure to allow each section to dry completely before you paint the section right next to it. Finishing with darker color and paint the eyes and nose last with dry brush work. Paint the shadow lightly and write your special birthday message. 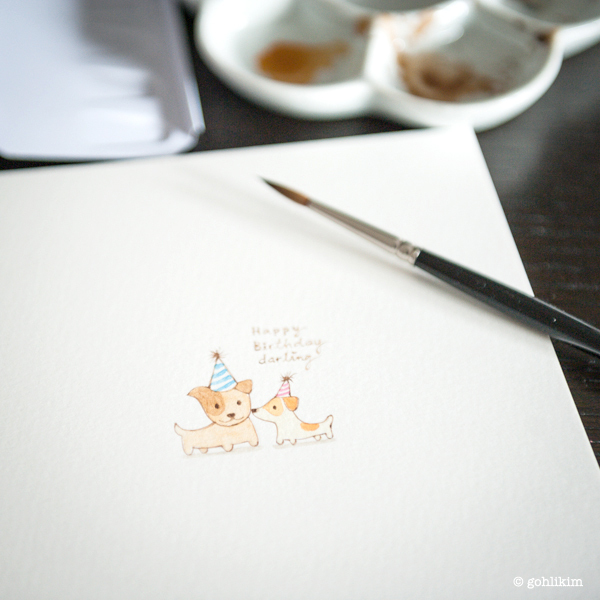 Trim the watercolor paper into a card and we are done! I hope this will inspire you to pick up your brush and paint a little. Materials i used: Extra smooth hot pressed watercolor paper 10″ x 7″ by The Langton, Winsor & Newton Artists’ colour, Series 7 brush size 4, H and B pencil and soft putty eraser.